Our modern variable repeat litho presses are all 7-8 colours, with in-line flexo units for coating or printing. One is equipped with plate and blanket sleeve technology, which allows us to print any repeat you wish! We use UV (ultraviolet) and EB (electron beam) equipment to cure our inks and coatings. This 100% solid technology ensures that we do not exhaust any harmful solvents, etc. into the atmosphere, unlike other printing processes. 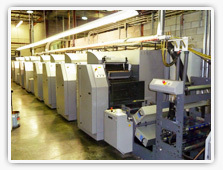 There are several advantages of litho printing, one being high quality process graphics with low plate costs. Design modifications can be done quickly and inexpensively. Litho printing is ideal for multiple sku’s with the same repeat length. We deliver! Our normal deliveries are 2-3 weeks! We do all pre-press work and make our own plates on-site, with an integrated CTP device. Gravure and flexo printers just cannot respond to quick delivery requests for high quality printing like a litho printer can! Some new jobs are printed and delivered within one week of receiving approved files. This is ideal for new product launches and special promotions! Our challenge is to take the expertise we have developed over the years printing flexible packaging into the exciting shrink sleeve market! We have new, efficient seaming and cutting equipment. 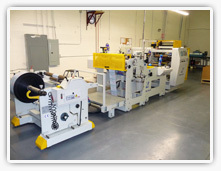 Our seamer is equipped with a system that ensures lay flat variation is monitored and minimized. Got questions? Get answers! Our Customer Service personnel respond to questions and issues promptly and efficiently! No run around!